I’ve arrived late to the Sevendust party. I first listened to this band a couple of years ago when I stumbled across their 2008 album Chapter VII: Hope & Sorrow. (Yes, the reason for checking them out was the guest vocal appearance by a certain Mr Myles Kennedy.) Last year they captured my attention again with their largely acoustic record Time Travelers and Bonfires. It was Karma. Love it! That said, I downloaded it on its Oct 2nd release date and I’ve played it and played and played it. 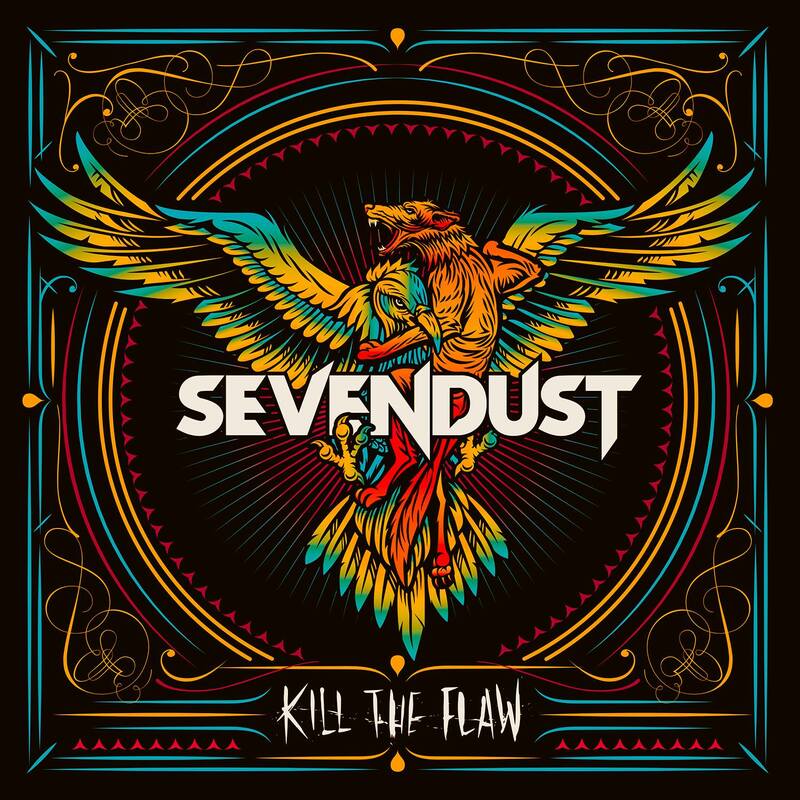 Kill The Flaw is Sevendust’s eleventh studio album. No mean achievement in itself. The album opens with the lead single Thank You. Despite a gentle introduction, you are soon left in little doubt that this is classic hard and heavy alternative metal – classic Sevendust. One of the stand out tracks off this album for me personally is Letters. It’s not as heavy as some of the others but it’s no lightweight ballad either. It showcases Lajon Witherspoon’s vocal talents and highlights the controlled talents of John Connolly and Clint Lowery on guitar. Stunning track. Cease and Desist is awesome. Again it’s not classic Sevendust. Absolutely adore the opening section of this track. Stunning richness and warmth to the tone of Lajon’s distinctive voice. This song has a bit of everything to offer. Part hard and heavy; part ballad. A skilful blend well executed. Chop is another stand out track. An eclectic mix of Southern influences guitar, solid bass line (good job Vince Hornsby), a powerful vocal performance again. Terrific chugging riff mid-song! Final track Torched sends this album out in a blaze of glory. Undeniably more metalcore influenced than the other ten tracks this one contrasts starkly with some of the earlier sounds. Powerful hard and heavy. Scorching ending to this album. If I had to single out one star of this album, it’s drummer Morgan Rose. Superb throughout! All in all Kill The Flaw is pretty much flawless. I may have arrived late to the party but I’m guessing I’ll be here until the bitter end. Sevendust have well and truly won me over with this one. When’s the UK tour, boys? This entry was posted in Uncategorized and tagged #albumreview, #alternativemetal, #blog, #heavymetal, #music, #musicreview, Sevendust. Bookmark the permalink.